Note: Bernard Brown at Philly Herping has kindly corrected my identification. Please see his comment below which provides excellent characteristics to differentiate between the Eastern Kingsnake and the Black Rat Snake. Thanks Bernard. I've included links to both the Rat snake - this link shows the Black, Gray, and Yellow Rat snakes - and the Eastern Kingsnake so that you can compare photos of these snakes. Luckily, the snake, correctly identified, was still nonvenomous; neither it nor I came to any harm. Meanwhile, visit House of Herps #7 to read about other herp adventures. 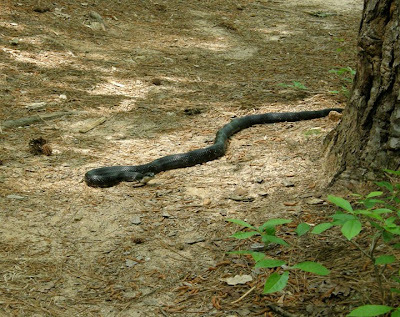 We don’t see many snakes these days – not even as road kill. I’ve been keeping my eyes open for snakes this year. It was mid afternoon; about 3:20 pm on a Friday afternoon. I’d stopped along the trail just after it left the dam (segment 4) to rest. A couple of runners came by. I set off again and wasn’t really paying attention. I came around a turn in the trail that was obscured by a tree. 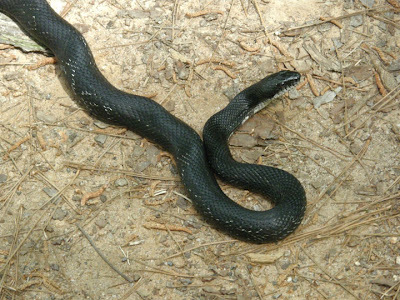 And there it was… A Black Rat Snake (Pantherophis obsoleta); a non-venomous snake found throughout Georgia. Obviously I startled it; even from a distance, you can see the ripples of the tensed muscles in its body. It was a blessing that it froze since I was startled as well. Luckily I was walking, not running – the encounter might have been quite different if I’d been running. My major concern at that moment, however, was whether my camera was ready. Since this section of trail doesn’t offer a lot of photo ops I wasn’t paying attention to camera settings. So the fact that it froze allowed me to get these photos. I edged slowly off to the left so that it could make a break for it if it wanted to. But it stayed in the same place. You can see the its white belly and the patchy white scale pattern on its back. 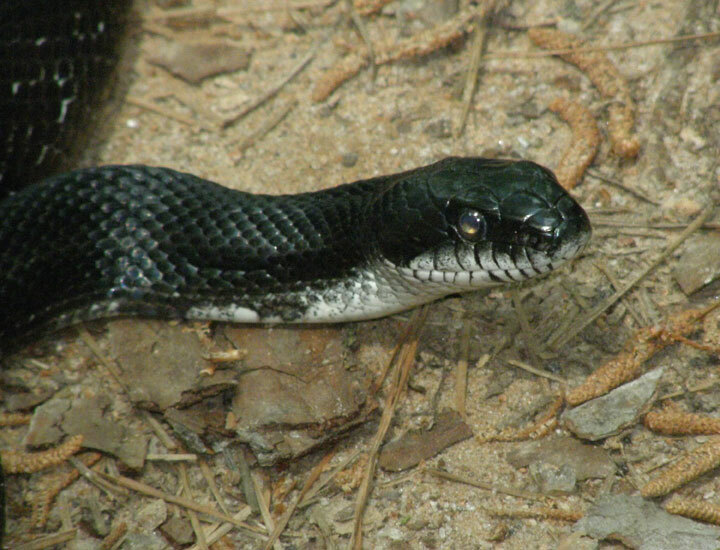 A close up of its head. Please may I go? By this time, it wanted to leave. It made a move but was still concerned by my presence. It’s leaving. It was only when it started to leave that it began probing the air with its tongue. It also ‘rattled’ its tail silently, kicking up a small dust cloud as it moved along. It headed off down the slope towards the lake shore, probably to get a drink. 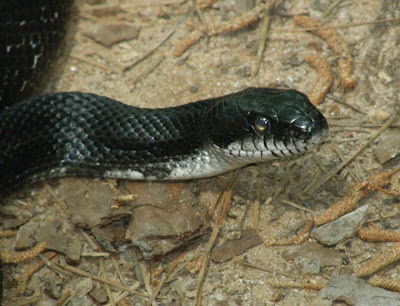 That is a beautiful snake, but it is a black rat snake (Pantherophis obsoleta - the taxonomy is in flux, used to be Elaphe obsoleta, and you might also see Pantherophis alleghenensis) - same species of snake I have as my avatar. They can look alike, especially in N. GA where the kings can have a very thin, pin-stripe chain pattern. The kings look a little more cylindrical, a little shinier, and with a less distinct head. 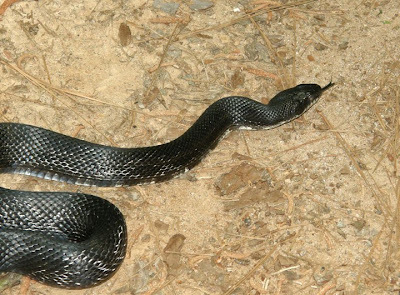 If you get them in hand, you'll note the slightly keeled scales of the rat snake, as well as its classic inverted-U body shape - slightly flattened side-to-side - that helps with its climbing habits. I'm updating the post with your correction; I appreciate it. I don't think I'm ever going to get so up close and personal to become an expert. Glad there are some experts around to help. Both species do bite sometimes, and they'll musk on you too, but otherwise they're a pleasure to get in hand. Both are constrictors, and so they can grip you back when you pick them up. Rat snakes are maybe a little more comfortable in hand (personalities vary, and I'll put them right down if they really thrash around), and have an inquisitive vibe about them. I caught one last week that nipped lightly just once, then gripped my hand well, crawled slowly along my arm to my shoulder, stopped, looked me in the eye, and gaped - a sort of deliberate response that indicated the end of the photo session. In case you can't tell, I'm a huge fan of rat snakes :-). I have to confess that I have a primal fear of snakes and I don't anticipate that I will ever voluntarily handle one. 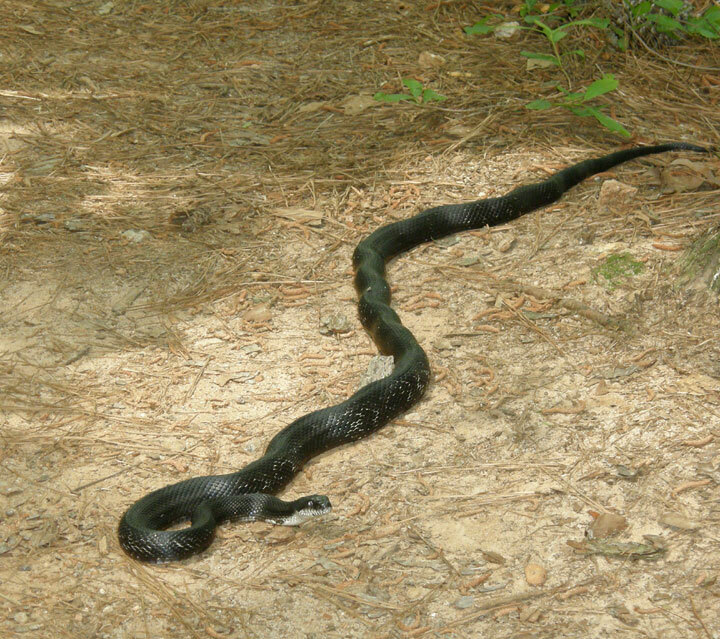 I have wrangled several snakes including Copperheads and Timber rattlesnakes so that my husband could photograph them for a herp survey. When you surprised it, did it make a scooching motion (moving forward a short distance than backward a slightly shorter distance, repeat, repeat) as if uncertain on whether to move? I like Bernard's descriptions on snake behavior while you are handling them and when to put them down. No Cindy. It just froze in the same position as when it saw me first and stayed that way, with the exception of moving it's head to watch me, until it decided it might be safe to move away and go about its business.